Smooth, remove scratches and pre-polish a wide variety of materials with our abrasive infused pad. Nexus Buffs feature a unique woven design and a low operational speed, delivering a long service life. 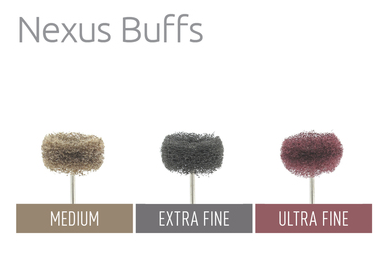 Nexus Buffs excel by giving users more control over the polishing process than traditional techniques and materials. In addition, they have a gentle action that allows the task to be completed without damaging the existing anatomical surfaces.